I drew the card ♣ 9 for 'Old' after I finished Challenge #9 - Texture while on the south coast of NSW. On the long drive home, I spotted an old, lone gum tree in a paddock just out of Bairnsdale in eastern Victoria. I decided (a few km down the road) that this may be an ideal subject for the 'Old' theme, found a place to turn around and back-tracked to the tree. I loved the old dead branches silhouetted against the cloudy sky and decided to make an old-style, sepia-toned, grainy, monotone image to complement the 'old' theme. I set up the tripod low down to remove as much of the distracting background as possible (to set the tree against the sky) but not so low that the foreground grass blocked the full view of the tree and the dead branch on the ground to the left. 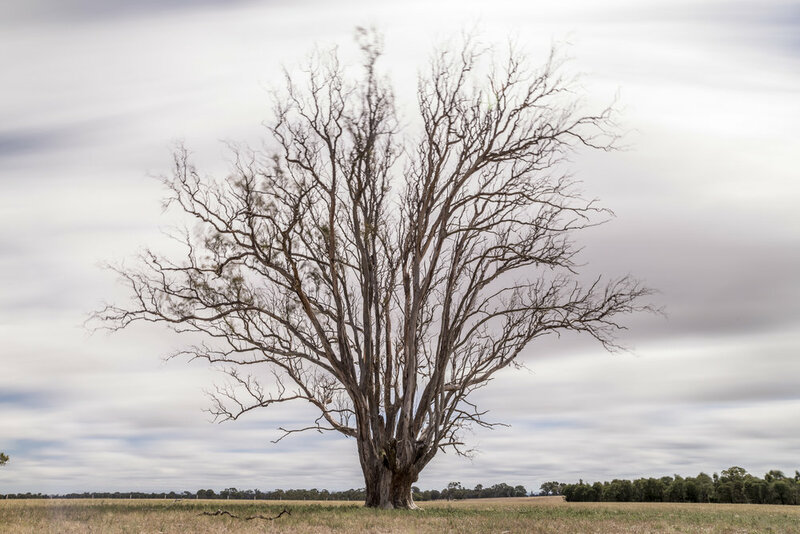 I selected a focal length to fill the frame with the tree but leave a little breathing space at the top of the image and placed the tree centrally in the frame to emphasise it as the main focus of the image—this shot is just about the tree. However, when I checked this test shot (above) on the back of the camera and changed it to black and white, it was obvious that the blue patches of sky were a distraction. It was quite windy so the clouds were moving quickly across the sky. I could either wait for a more uniform cloudy background (which did not look likely) or slow the shutter speed down to blur the clouds in the background. This would also add some blur to the branches in the tree further enhancing the 'old'-ness of the shot—early photography was done with long exposures so movement-blur was common. After a bit of trial and error to find the best shutter speed, I settled on a 10-stop ND filter and circular polariser, which resulted in a shutter speed of 160 seconds, providing a nice blurry sky and slightly overexposing the image to further enhance the old feel of the scene. 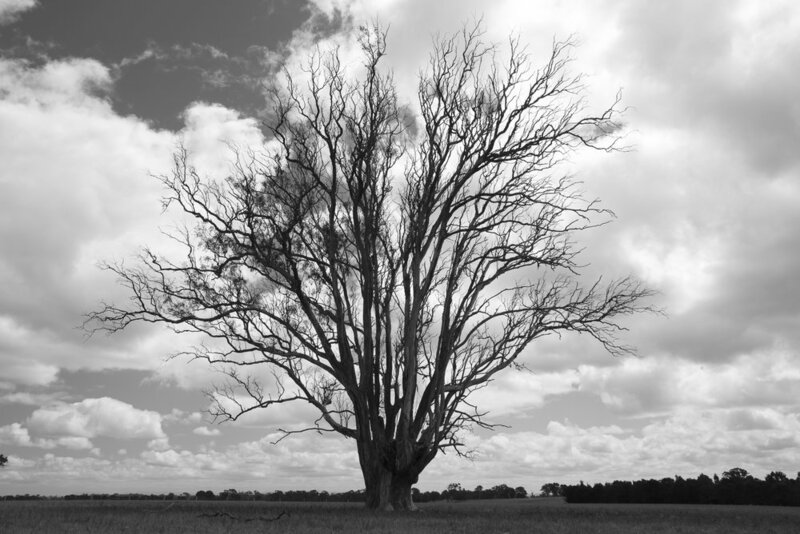 resulting in the final old style image of an old tree. Check out my YouTube video where I show how I processed this image.